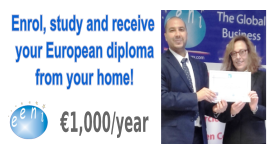 Syllabus of the Online Course (Subject): Association Agreement between the European Union and Tunisia. Learning materials in or Unión Europea-Túnez Union européenne-Tunisie União Europeia-Tunísia. Tunisia has in force an Association Agreement with the European Union within the Euro-Mediterranean Partnership (EUROMED) framework. 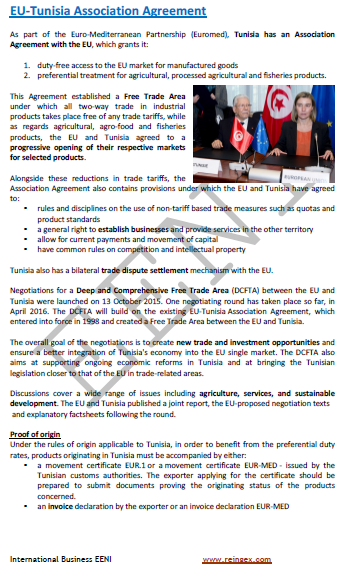 The Duty drawback under the EU-Tunisia Association Agreement is prohibited. Type of cumulation: complete, diagonal and bilateral. Tunisia has furthermore a Dispute settlement mechanism with the European Union. The European Union-Tunisia Association Agreement belongs to the European Economic Area (Western Civilisation) and the Islamic Civilisation.